I’d like to take this opportunity to point out some good dealers and collectors and I would like to start by introducing you to TRACKS. Tracks was established in 1989 and has grown to become the world’s leading dealer in Beatles autographs and memorabilia. We also stock all Beatles merchandise on the day of release. 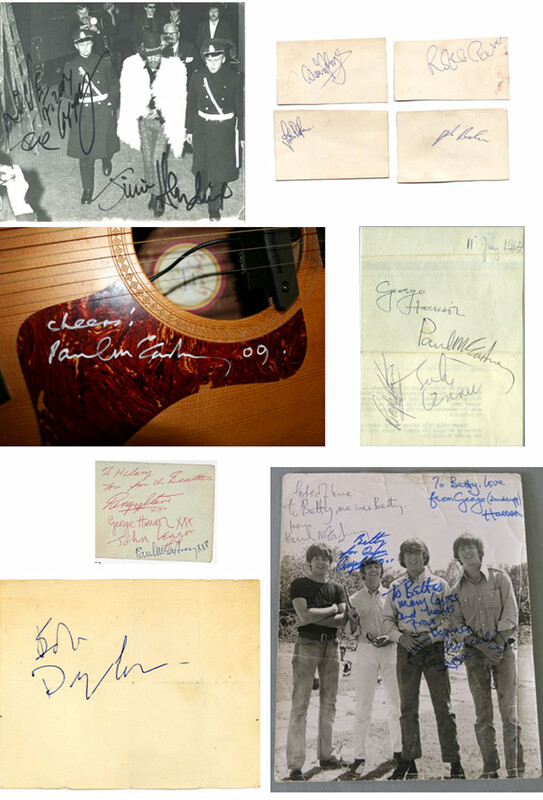 In addition we carry a huge range of rare pop memorabilia and autographs relating to all of the major artists from the last four decades, The Rolling Stones, Jimi Hendrix, The Who, Led Zeppelin, Pink Floyd, Bob Marley, Buddy Holly to name but a few! I have known Paul Wane the owner for about 20 years. We started out at about the same time. We have met on many occasions and pick each others brains from time to time to learn even more about autographs and history. He started being a Beatles only dealer selling records, toys, posters, promo items and autographs of The Beatles. He and Jason (who also works there now) are experts in the field of Beatles and various 60’s and early 70’s bands. Tracks has sold everything from hand written lyrics to “Getting better all the time” by Paul McCartney to Rolling Stones signed vintage photos and everything in between. Below are some of the items they have sold in the past. As you can see these guys do come up with some great authentic items. They offer a LIFETIME guarantee of authenticity with 100% refund if ever found to be not authentic. These guys are true professionals and treat you right. I give Tracks a double thumbs up in the autograph community and consider them one of the best in the business.